Gee, what's wrong with this picture? I can't imagine how long that ingredient label is. Regarding Weight Watchers, I wanted to mention that YES, you absolutely can blend WW with Nourishing Traditions! Basically, what we did was choose good, whole foods (which is perfectly in line with WW), but substitute whole milk and good oils for their suggested fat-free milk and margarine, etc. He counted coconut oil as either olive oil or butter – both of which are in the plan. Whole milk has higher points than the recommended fat-free. Of course, my husband was rebellious enough to *announce* that he drinks whole, unhomoginized FAT filled milk, and EATS coconut oil, and that his wife serves him eggs cooked in real butter, too. And yes, he *did* have the riot act read to him in that particular meeting, and a chart shoved in front of him ‘proving’ that coconut oil was NOT an approved ‘heart healthy’ recommended oil in the plan! WW mainly helps him write down what he eats, and not OVER eat. He also notices that when he eats real, whole foods – he is satisfied with a lot less than restaurant or processed foods filled with MSG and sugar to compensate for the fake oils. We feel the coconut oil helps control the appetite, too. Have you tried Weight Watchers in the past? If so, please share your thoughts! Do you have allergies? You have to check out the comments at this post! Great post. I think I may have to try WW. This is a great post and comments! I have done weight watchers in the past (the old program). I didn’t realize this till later, but as a nursing Mom of a 1 yr old, I was given 30 points, which is about 1500 calories a day. I made sure to use REAL food (NT) but that used up my points real fast. With my second baby I did a not-very-strict yeast diet, but it did remove all gluten, sugar, and even dried fruit from my diet. All of a sudden – energy, feeling, good, weight loss! But it is so hard for me to keep that up (the no chocolate thing) even though I feel good on it. And I so easily slide from just a little sweet, to way way too much. I am a sugar/carb addict. So this time I am going to try WW new program again, mostly as a way to help me make sure that I’m keeping control of my sugar intake. I will probably limit grains as they seem to make me sleepy, and use full-fat products (butter, coconut oil, etc). One of the commenters was right – a low-carb NT diet is very similar to Atkins. Thanks everyone for your GREAT comments! I would love to hear updates! Woohoooo!!! That’s awesome! And I love how you’re doing it! Here’s an idea. As much as I think losing weight is more about food than exercise, sometimes exercise gives us a metabolism boost we need. What if you ate more of the calorie dense Real foods to be full, but kicked up your exercise a notch?? Like walking 45 minutes daily or something…? Just a thought. Keep us posted!!! Weight Watchers wants you to continue having foods with high (anything over 7% sugar) sugar/fructose so that they can continue selling you their foods and make a profit. They will say “everything in moderation” or, don’t worry “it’s portion-controlled” but the trouble with sugar (the fructose half of sugar, the other half is glucose which is ok) is that it is incredibly addictive. But of course they won’t tell you that because they want you to continue coming to the meetings and doing it there way. We have been eating olive oil, butter and full-fat dairy for thousands of years. The low fat stuff is usually laden with sugar because that is what sells. Okay, so I’ve been following the WW ‘core’ plan replacing NT options for 8 weeks now. It has been going really well for me – I’ve lost 25 pounds so far and it has not been difficult at all. In fact, it’s been easy and I feel so good! I even went to LA for a week and a half and ate out almost every meal and STILL lost weight! I eat only real foods, I don’t worry about the WW fat recommendations (meaning I tend to eat more fat calories per day than they recommend, and eat NT recommended fats), I make my own sourdough/sprouted grain breads, I soak my grains and legumes, I eat raw whole milk/cream/yogurt/cheese/kefir, I eat good quality meats and poultry, pastured eggs, I only use natural sweeteners (maple syrup, honey or organic cane sugar), bone broth and lots of lacto-fermented foods (every day) along with fresh, organic fruits and veg (which are now ‘free’ on WW). I find that my sugar cravings are nil, I feel more satisfied, more in harmony, and again, I feel really, really good. So far I am able to get the program to work for me using NT options. I’ve got a long way to go yet, and I’ll keep you posted as to my progress. This has been an interesting read! I’m a WW lifetime member…hubby and I both. The last time I lost weight on the offiicial plan was back in 2004 with points and using splenda and all that fake food. That was before I started my REAL food journey. The last time I lost weight on the plan I basically used their CORE plan (which is real food based) and using what I know to be healthy fats. In this post I listed my rules for eating clean. But in doing that I also limit my carbs even though they are healthier carbs. Not a low carb diet per se…because I had never done Atkins or South Beach. I was familiar a bit with Atkins because of my hubby…back in college, but he always did it not quite as healthy because he never ate ANY veggies, and instead of adding in carbs slowly, he just would go completely OFF the diet and regain the weight. Now that he is a Lifetime WW member…he learned portion control…and over time with my real food way of eating, he’s learning to add in more veggies, etc. Part of it I think is because he got into running, loves my green smoothies, but also because we are now 40….and he knows he just plain FEELS better eating clean foods. So now he has weight to lose, and at a bookstore one night he picked up the Atkins book. When he got interested in it this time…since he knows my REAL food beliefs…over and over he kept saying, “hey, this is the way you eat.” Of course it immediately brought back bad memories, because I remember him gorging on meat and mayo, no veggies and at the time I was a vegetarian (in college)…haha..So I had negative associations with it. Then he brought home “fake food jello” and it about sent me over the edge. I try not to say anything because I know he needs to lose the weight. He is out taking LONG walks and takes the kids with him. I’m going to be the unflavored gelatin and find a healthier way to make it for him (fruit juice)? After some googling, I am finding a few other REAL food bloggers that have experience with low carb. I am definitely going to do the 2 week induction to focus back on my clean eating (sugar creeps in for me esp in chocolate)…plus I want to drop about 10-15 lbs so I know that would be a great start. Another thing is that I just like to FEEL better and have more energy. All the stuff I’ve read about Atkins so far he talks about that. Another side note is for the past few months I’ve been trying to figure out why I am bloated after certain foods, and why some foods make me tired. I don’t have the symptoms of gluten sensitivity, or celiac or lactose intolerant, etc….so couldn’t figure it out. First time I noticed it was my whole wheat pancakes (I mix fresh whole grain), but I don’t soak or sprout. Immediately after eating them I want to take a nap. So they are a rare treat. I started limiting my bread/pasta type (even though fresh ground whole wheat) to 1x a day if at all and feel much better. Then yesterday…I made a big pot of brown rice. I sat down and had some with some whole milk, raisins, smidge maple syrup, frozen pineapple and few walnuts. It was so good…but again, immediately after eating it I felt like someone had drugged me!!! No lie, I actually needed a nap! It was awful. That’s what made me pick up his Atkins book. So now I’m convinced if not a grain sensitivity then at least I need to keep them at a mininum. I’m now wondering about the GAPS diet I keep reading about as well. So if you or any of your readers know of any REAL food/low carb or atkins type blogs or sites those would be appreciated. I’m going to check out the ones you’ve linked to here. Also, I’m so glad I’ve now heard his theory behind the high fat & much more protein and lower carb thing because in the past I’ve always tried to reconcile REAL food with WW, and so I was always indoctrinated into LOWERING my calories even with higher fat. Turns out it’s better to eat more calories…but eliminate the carbs (exept for the non starcy veg) and then add them in slowly. Sorry for the novel…so excited to read others viewpoints on this…and I’m sure this lower carb way of eating will creep into some of the recipes I post. Did anyone happen to copy the list of NT foods points from the link that Jamie posted? I tried to link to it and it’s been removed. Thanks!! I know this is an old post but I just wanted to comment. I have been trying to eat traditional foods with my family for quite some time but my weight just kept going up and up. It’s a portion control issue. I am on WW now and it seems to be working for me. However I do not buy into their low fat mantra because I know fat is not the devil. One of the health guidelines is to get 2 teaspoons of “healthy oils” a day. These are veggie oils and olive oil. I am a rebel in this area, I count real butter as a healthy oil! If I could find some nice coconut oil I would count that too. Other than this I have been sort of following their rules because I NEED to lose. Now that I am comfortable with the plan I am ready to make a few more tweaks and work the plan with traditional foods 🙂 That is how I landed here. Keep us posted as to how it goes, but I’d also suggest you rebel on the *amounts* they recommend, too. I don’t think 2tsp. a day is NEARLY enough. You’re on the right track with the butter – it will help you stay full longer and also help your mood and overall health as you lose weight. Hi, Kelly! I’ve been browsing through your blog and have found great recipes and helpful information. As far as WW goes, I think the calorie allotment is too low. I did WW before I discovered NT and it worked up to a certain point and that was it. The scale would not budge. I actually weigh 13 lbs less eating more calories coming from healthy foods than I did while following the WW plan. I would think with all the NT calorie dense foods it would be hard to stay on WW for an extended period. Hi Sharon, I’m glad this post has helped you! It wasn’t actually my husband who was on WW, it was a commenter, Christine, hopefully she’ll update us! I just devoured NT over the last couple weeks and have been incorporating raw whole milk, grass fed butter, etc into my diet. My energy level is up, so I’m guessing it’s due to more protein and higher quality fats to metabolize the vitamins. I’ve done WW on-and-off over the years with great success, so this post and subsequent discussion is exactly what I needed to blend the two. Thanks! Kelly, how is your dh doing on WW now? @ 3hrsts, the No S diet is awesome. May have to add that in too. I love your website. Awesome! I tried WW and it is so low -fat and following the healthy guidelines and stuff. The thing I hated about it was they promoted junk food, which I think is wrong. When I tried to tell them I eat whole foods such as whole milk, real eggs, real butter,etc, I got some crazy looks. I stopped going. But I see you can do the WW program eating real food. I guess the key is to not go to the meetings. Keep up the good work with your blog. You now have a big fan! I don’t think 7 pts for the ice cream is bad from a WW standpoint… a piece of cake can be 10 pts! If you have 24 pts/day + 35 flex points, it’s not hard to work in the occasional treat. You could even enjoy the ice cream for breakfast with some low point fruits. I don’t do WW anymore (though I’ve tried it more than once)… I simply eat healthy foods, healthy NT fats, and lots of fruits and veggies with no calorie beverages (except occasional coffee and cream). I LOVE this ice cream and so do my kids! It’s delicious to add in some chopped up fruit or crushed vanilla beans as well. YUM! That’s good info and it shows how bad it looks from a WW standpoint, but since we all now know that all calories aren’t the same, we know not to worry about what WW thinks! I ran the nutrition information on the ice cream (https://kellythekitchenkop.com/2008/10/best-vanilla-andor-chocolate-ice-cream.html)… 1.5 quarts= 6 cups or 12 – 1/2 cup servings. For each 1/2 cup serving, there are 7 WW Points. I’d love to try and help, what specifically are you wondering about? I’ve often wondered how much work it would take to be a WW member (for support and structure) AND use only real food…This is heartening and if your blogger friend would be open to sharing what her “plan” looked like…I betcha’ LOTS and LOTS of us would LOVE access to her experience! I, especially would LOVE to know more…Thanks, KK for spotting this great reply amongst all your fans! It’s the first thing that has budged the weight I gained from steroids and hypothyroidism. And it’s so easy. I am happily enjoying eating all I want of the good, fat filled NT food I spend so much time preparing, and never have to keep track of a thing. I’m with Organic and Thrifty–I’m slowly loosing weight eating more food than I ever thought I could eat and not gain weight by limiting grains (not removing them) and using coconut oil. I did weight watchers for awhile, but my energy just dropped and my job requires I have a certain amount of energy so that didn’t work at all. As soon as I dropped out, I gained back the 10 pounds I lost pretty quickly. (I needed to loose about 30 at the time). I’m back down to the weight where I started weight watchers and hope that as I watch portions a bit more with real food that I’ll loose even more! Fascinating discussion. Thanks for the encouragement to eat real food! Not a WW member, but I shed lots of lbs after adding coconut oil and limiting my grain intake. I have always been so annoyed by the “fake food” that’s passed off as diet food, and I’m so glad to see some momentum towards whole foods and WW! Great post!! I too believe more in whole foods instead of FF and the like. Last month I lost 5 pounds after I stopped worrying about calories and instead focused on nutrition! I wonder how many points this “almost-healthy” ice cream would be?? I probably don’t want to know. All the nutrients and benefits of the healthy fats should knock off some of those points for sure…but WW doesn’t see it that way, unfortunately! But I have seen my dh eating a bowl of ice cream late at night, telling me he is still within his points! I don’t think that counting Points incorrectly for items would be the answer – I think it’s just a matter of finding a good balance of what works for you. As Christine mentioned, portion control is a big thing. The great thing with with the higher calorie/fat choice is that you’re probably going to require less of it than it’s low-cal counterpart which will in turn balance out your Points. WW also recommends including some healthy oils into your diet and when members are struggling to spend their Points values or looking to change things up I often tell them to go back to things like high fat milk products or non-diet versions of things and to make sure that they’re getting in all of their Good Health Guidelines before choosing the 100 calorie brownie. Lol Erin. My dh is just a regular, busy guy that loves restaurant food. He still has a ways to go, but he is about 21# below where he was 6 or 8 months ago, and hopefully, maintaining. He is not at all strict. What helps most is when he logs what he eats every day consistently. Dh’s fav. breakfast (one of) is one egg on one whole wheat english muffin (1 t. butter) and grilled tomato with it (sandwich). I think that was 4 or 5 pts? It really does hold you till lunch. I use CO intead of butter and do not eat it as a sandwich sometimes, too. It seems like the point counting you mention would work, as long as you didn’t use all your extra points on “healthy” treats, like whole wheat/rapadura cookies. Most of the people who seem to lose the most with Real Food choose a lower grain diet. I would be interested in the exact plan that Christine’s husband used – I’m a lifetime lapsed WW member who is trying to eat Real Food all the time now, but I haven’t seen much weight loss. Neat to hear success stories with WW and Real Food! Very motivating. What about this: when figuring out your points, when WW says that for example (I have no idea if this is even close to the real point values, but you know what I mean) if real butter “costs” you 5 points, but icky “no calorie” margarine or whatever junk they might recommend would only cost you 1 point, my suggestion is that you STILL JUST COUNT IT AS 1 POINT. Butter, coconut oil, etc. HELPS metabolism (remember the book “good calories, bad calories” – they are NOT all the same), so any extra calories would be off-set by all the other benefits. Wouldn’t that work? Yes, that’s my suggestion too, I’ve tried it a little and plan to continue this year to see what happens. I lost 50 lbs last year doing it with just a few adjustments, this year I’m going all the way whole fat and no sugar free except a little stevia. Would love to hear more success stories. And one great thing about weight watchers is that most of us are not perfect and we have times in our life where due to one thing or another we can not adhere as closely to our very clean ways of eating as we would like to and ww allows for that! Got to love that! Ashley- it’s so good to hear from a leader’s perspective! Although I am not too familiar with the new Momentum program, I think it’s a shift in a better, healthier direction. Thank you for your insight! I’ve been doing WW since August 2006. I lost a total of 33 lbs on the program and have been maintaining my weight since April 2007. I’m now also a WW Leader. This past November I was diagnosed with Crohn’s disease and my whole attitude towards food has changed. I am no longer looking for the best variety of 100 calorie packs or fat-free variety of things. I’m using food to nourish my body and provide it with the vitamins and nutrients it needs. I’m working to cut out refined sugar and I’ll be getting results of food sensitivity testing in a few weeks to see what foods I should and shouldn’t be choosing. I count my Points just as I always have, but I’m just making different choices in how I spend them. I think WW is undergoing a shift as well. While they do offer the various snack foods, the new Momentum program has put greater importance on the “Filling Foods” – wholesome nutritious foods, that are going to help sustain you longer and are lower in Points (fruits & veggies, lean sources of protein, whole grains etc). In my meetings we often talk about the Filling Foods as well as our Good Health Guidelines. And if you need some more of my thoughts on Weight Watchers – please get in touch!! Ashley, it’s heartening to know that you can do WW with real food. I would LOVE more tips on what you eat. We were doing WW until I discovered the weston price foundation and we switched. Ever since then my husband has been gaining weight quickly. Now he wants to go back and eat everything that we had on WW! I am devastated! I am making some compromises, but he wants to eat more food – so he wants things that are low in points = low in fats. He will not touch butter, raw milk – but im not budging on the coconut and cod liver oils. Im only afraid for his health, I want him to lose weight, but heart disease and diabetes run in his family and it scares me! I need lots of advice from anyone!! I wish you could convince your husband that if he ate the Weston Price way (Real Food! ), but only low carb and LOTS of healthy fats he would be FULL and lose weight for sure! He’d also be much healthier than he would on the crappy low-points WW foods. Jimmy Moore’s blog would be helpful to him, my sister loves his blog and is losing weight. Sallon Fallon has said in NT that the diet closest to NT Real Food “eating” is the original Atkins Diet. I need to lose about 10 lbs and did weight watcher about 7 years ago and I lost 13 lbs successfully, but with Thyroid issues and menopause I have gained the weight back. I am currently reading a great book entitled THE DIET CURE, by Julia Ross, which outlines a program of Amino Acid supplementation for chronic dieters the help them regain their health and to “cure” food cravings for carbs, alcohol, and fatty junk food. She also relates the info that the World Health Organization has established that STARVATION BEGINS UNDER 2,100 CALORIES PER DAY! Wow! As far as “how” low-carb is low, I’d say that yes, a Southbeach diet only with real food would be really low. And I’d also agree that Atkins is a healthier diet than Southbeach. To drop weight quickly you might consider (do your own research though, don’t listen to just me) going very low carb for a couple weeks for a nice jump-start, then adding teeny amounts of carbs in slowly to see how your body does as you transition to the long-term plan. I can’t believe WW tells people to only eat 1 T. fat a day! I did WW before I really switched our family over to eating mostly the NT way. WW was good for me to address a lot of my issues with food…stress eating, bored bingeing, mindless eating…and to make sure that every bite that went into my mouth was worth it. I lost over 30 pounds, made it to Lifetime and have maintained for over a year. They now have foods on their “filling foods” list, but I’m not sure what that really means. I don’t go to meetings much any more because I just have too much to do, but I still think it is a good program, aside from the low fat mentality so dominant in the diet industry. I, too, have decided to de-lurk and comment on this interesting topic! I had been following WW from 2005-2008. I stopped cold turkey when I started seeing a chiropractor, and he introduced me to REAL food. I learned so much from WW, like journaling, eating to satisfaction, etc. But I am having to un-learn a lot of things, too, such as staying away from the processed, FF, SF foods that I lived on. WW is always changing, which is a good thing. The Core program helped me learn how to eat better foods, even though everything was still mostly FF and SF. At least I stopped eating frozen dinners! I would love to try and do WW again using Real,wholesome foods and see what happens. I have tried to lose weight without it and have not been doing very well! Kelly- thanks so much for your blog. I enjoy looking at it every day and learning new things! While my friends and family still think I’m following yet another “new craze” I know in my heart that this way of eating is the best and most nutricious way to go!! Thank you for addressing this! I have been reading your blog for a couple months and am de-lurking to comment because this is so relevant for me. I have been doing Weight Watchers since June 2008 and have had a major shift in thinking since then. 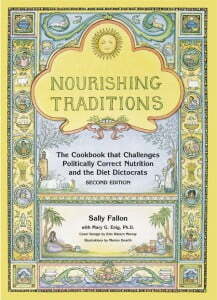 I’ve been reading books and blogs about real food/nourishing traditions and my perspective has been greatly challenged! Most of the community input and ALL of the Weight Watchers information is the traditional low-fat mantra. The “Points” calculation is based on low-fat/high-fiber choices, so eating traditional full-fat foods like butter and nuts will definitely penalize your points. 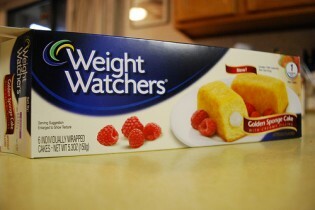 Many of the food products sold by or endorsed by Weight Watchers are FULL of junk. The recipes shared and products recommended by members on the message boards (diet coke cake, Fiber One products, Egg Beaters, artificial sweeteners, fat-free dairy) are no better. That said, it’s still a good program–I need the self-discipline it helps me develop, and it’s an easy-to-follow, flexible way to keep track of (and limit!) my food intake. I’m still learning how to fit REAL food into my points allowance (glad to hear you’re making it work, Faith–that encourages me to keep trying) and not be tempted by the low-points, junk-filled, easy-to-grab options touted by Weight Watchers and the online community. I also do Weight Watchers eating all real food. No fat free, sugar free, highly processed junk here. It’s very possible to do it with real food, you just use up more points quickly. But, I find eating real food fills me up therefore I don’t need more food. I drink whole milk, eat real butter, coconut oil (in place of the healthy oils that WW recommends) and pastured meats. Thanks for this post Kelly. How much have you lost doing it this way? I ate a bowl of granola the other day with raw milk and it was 9 points! That means I could eat three bowls of granola a day and be done with my points!!! That’s why I’ve had a hard time doing it eating real foods. Can you give a sample of your day’s food/points? I don’t do WW anymore, but I’ve put up some sample NT foods and estimated points… hope this offers a bit of help!